Aging baby boomers will soon want one story homes. And many of them will want the vitality of city living without the cost of a large and expensive metro area. And some of them will fondly remember their old University. Retirement homes in conjunction with Universities have become increasingly common. The housing can be privately developed, with alumni and retired faculty targeted as purchasers. A number of programs have been developed where private developers work with Universities to market retirement communities to alumni. The involvement of the University can be minimal, but usually involves letting their alumni know about the proposed development and conducting a survey to find out what type of homes they prefer. The alumni bring a love of the University, a pool of supporter / volunteers / students, and the potential for donations and bequests. They can also afford a nice home, selling their single family home in a more expensive housing market, and moving to Peoria. From the City perspective a program to bring retired alumni back brings in affluent citizens with retirement nest eggs. They spend money, don't need jobs, and contribute to the city. They would help to rebuild several of our neighborhoods that need redevelopment. In marketing Peoria to national developers, we encountered a number of Bradley alums and one who dated a Bradley student. They all were interested in how the University and City were doing. Bradley Alumni Developers would be obvious candidates for recruitment for the development of one or more retirement communities. There are also a number of firms that specialize in this type of housing. I have listed a few of the web pages below: You will notice that Campus Continuum continuously conducts a nice web based questionnaire aimed at alumni retirees - a pretty effective and low cost way to see if there is interest in retiring back to the campus, and a low cost way to help figure out the type of housing desired. The Warehouse District would be a great location for this new housing. Easy walking distance to the Civic Center where the Bradley Braves play, the baseball stadium, and the Riverfront, and one mile from campus. 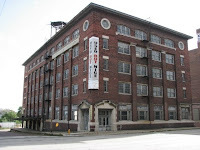 And right next door to the campus in Renaissance Park would also be a great location. The link below describes the program of a company that specializes in University Alumni Housing. The web page below describes a very nice alumni housing development for MIT and Harvard. A development like this would be great for Peoria and Bradley University.